Be a 360Karma VIP - It's FREE! Catherine Gray is a huge advocate for women in our community. She works tirelessly to help them create success in their lives and to grow personally and professionally. Her ability to put others' needs ahead of her own is well-known among many. Catherine lives, loves and thrives, sharing her positive, empowering approach with all whom she encounters. Her book, web series and workshops are perfect vehicles to broaden this new paradigm as she touches lives around the world. Catherine Gray is one of the most creative, inspiring, and kind women I've ever met. She is a magnet for good karma, bringing out the best in others, attracting good things and good people wherever she goes. I know that 360Karma will be a huge success and will encourage all women to persevere and realize their dreams. I can't wait to read her new book, "Live Love Thrive!" Catherine Gray is a magical magnet for connecting people and making things happen. Her core energy emits brightly at a high vibration attracting beautiful inside and out like minded people. Excited for this endeavor and to read the book and watch the web series. A compilation of true stories about ordinary women who are doing extraordinary things to make the world a better place while they Live, Love and Thrive. 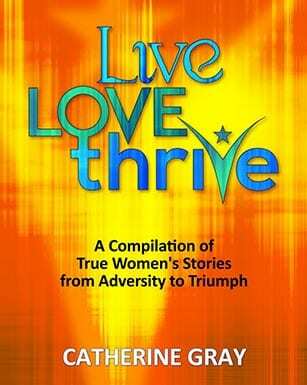 Each story shares inspired insights about overcoming obstacles to manifest miraculous accomplishments in life, relationships and work!